Hurricane Nicole has continued strengthening and is now category 4 on the Saffir-Simpson Hurricane Wind Scale with sustained winds near 130 mph. It is forecast to pass either directly over or very close to Bermuda later today. Whilst Bermuda sits in an area which frequently sees tropical storms and hurricanes pass close by, a landfall of such an intense hurricane would be unprecedented. 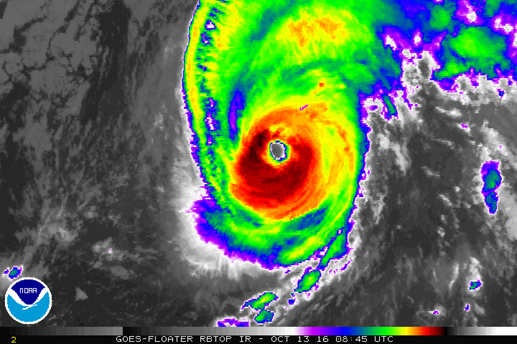 In 2014 Hurricane Gonzalo made landfall with winds near 110 mph. In 2003 Hurricane Fabian did not technically make landfall over Bermuda as the centre of the eye did not cross land. However, Bermuda experienced the strong winds in the eyewall which were estimated near 115 mph at the time. Both of these hurricanes caused considerable damage on Bermuda. Going further back in time, a hurricane in 1939 had winds strengths of 130 mph and passed within about 80 km of the Bermuda coast. The strongest hurricane on record to pass directly over Bermuda occurred in 1926 with peak winds near 120 mph. Thus if Hurricane Nicole did make landfall over Bermuda at its current intensity, it would be the strongest to do so in a historical record dating back over 160 years. Heavy rain is already falling over Bermuda with up to 200 mm expected. A storm surge of up to 2 metres is possible with dangerous surf and rip currents. After passing close to Bermuda Nicole is expected to remain in the central Atlantic for some time and become a strong post-tropical cyclone. Nicole is not expected to directly impact the UK and is eventually expected to head towards Iceland. However, it may induce the development of a ridge of high pressure over western Europe next week. A tropical depression has formed to the east of the Philippines and is expected to become a tropical storm later today. 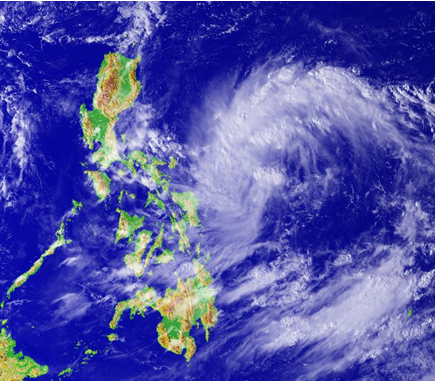 It will track towards the west and could become a typhoon before making landfall over Luzon at the weekend. Irrespective of whether it attains typhoon intensity it is likely to bring 300-500 mm rain and the potential of flooding to parts of the northern Philippines. Further strengthening is possible early next week as the storm crosses the South China Sea. A second landfall over China or Vietnam is likely by mid-week. This entry was posted in Met Office News and tagged Atlantic hurricane season, Bermuda, flooding, heavy rain, Hurrican Nicole, Japan Meteorological Agency, Philippines, Storm surge, strong winds, tropical cyclones in the Pacific, US National Hurricane Center. Bookmark the permalink.